We’ll be creating a child theme for our own Mantra theme but this guide works 100% for any WordPress theme. If you don’t already know it, find out who’s hosting your site and get the FTP log-in details. It’s a hostname (usually the same as the domain), username and password. Next get a FTP client. If you’ve never used one yet, we recommend FileZilla. It’s free and easy to use. Now it’s time to access your WordPress themes folder. 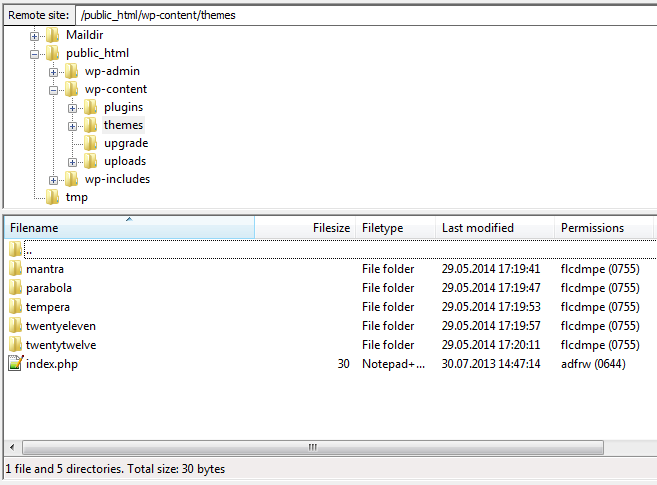 The themes folder inside your WordPress installation. Once here, make sure the theme that you want to create a child theme for is available. In our case you should see a folder named mantra in there. Now create a folder called ‘mantra-child‘. You can actually name it anything you want but for this example we’ll go with ‘mantra-child‘. The name you give this folder will not be the actual name of your child theme. You’ll give your child theme a name in the next step. 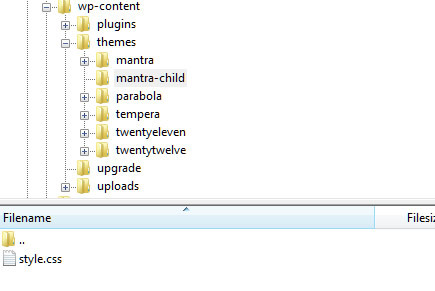 Remember: the newly created ‘mantra-child’ folder that will contain all your child theme files, is in the same place with all the other theme folders. That’s right, parent themes have them too. And this file alone is enough for you to have your own child theme. Either right click in the FTP client and select ‘New file’ or create the file on your desktop and then upload it onto the server; either way, place a style.css file inside the ‘mantra-child‘ folder. Create a style.css file inside your child theme’s directory. Files with the .css extension are the same as .txt files and can be opened with regular text editors. We suggest Notepad++ – it’s also free and it’s what we use. Description: This is a child theme for the Mantra theme. Oh mama, if you could see me now. This is the information header for your new child theme. It gives all info necessary for your child theme to be recognized by WordPress so you can activate it from the Appearance » Themes section in your WordPress dashboard. It’s all pretty self explanatory. Theme name can be whatever you want it to be; same goes for Description. The Theme URI and Author URI are links that you can choose to not use at all so you can delete those lines altogether if you don’t want them. Version is again all up to you if you wanna use it or not. The most important part of the information header of a child theme is the Template field. Here you must input the exact name of the directory of the theme you are making a child theme for (capitalization matters!). If you wanted to make a child theme for the Twenty Twelve theme for example, the Template field would’ve been “twentytwelve” just like the folder of that theme. After you’ve filled everything in, save the file and you can go and check your child theme under WordPress dashboard » Appearance » Themes. You will see there all the details you gave it. And you can activate it as well. Go ahead and activate it. Then check the front-end of your site. Again, it’s pretty self-explanatory. Since our child theme’s style.css is overriding Mantra’s, we’ll just import that file into our own. Remember that when creating a child theme for another theme you have to replace mantra with that theme’s folder name. Create a folder for your child theme in the WordPress /themes folder. You can name it whatever you want. And now you have yourself a child theme. It doesn’t do much, actually right now it’s just an exact copy of the parent theme. But from now on, every CSS declaration you’ll write in your child theme’s style.css will override anything in the parent theme’s style.css. Go crazy with it! Just don’t overuse it. Stick to specificity first and only use this when that fails. It’s difficult overriding !important rules as there’s no !important-er to aid you. If even after adding the !important the style still doesn’t apply it means that the problem is elsewhere. Either you’re not using the correct selector (‘#content p‘ in our example) or the actual declaration is wrong. Even typos are a common reason for this. If things aren’t too clear, you can read more about CSS specificity. Now that we have a working WordPress child theme we can take things further with functions.php. Would love to see this for Kahuna theme. Not to mimic the wordpress codex instructions, but each theme has special enqueues that don’t follow the codex pattern. We’ll have to update the child themes tutorial (mostly the enqueues and style loading part) for newer standards and include actual child themes examples for all our themes. Hopefully we’ll find the time to do this soon. It’s the old method, right? Do not better put a code in the file functions.php, now? Yes, using @import is a less efficient way. We’ll be updating the tutorial to suggest the currently recommended way (by using enqueues in the child theme). Hi guys, I’m working on a Parabola Theme. I can’t able to create a Theme Child. I followed the same routing in the other website i buidl but in the back office I see just a corrupted theme… I can’t explain why. Can you help, please? What does your child theme’s style.css file contain? I am trying to make a child theme on Fluida basis. I need to replace the function fluida_setup() in /includes/setup.php which is hooked to ‘after_setup_theme’. Unfortunately the child function does not get called no matter where I hook it – I tried to init, after_setup_theme, setup_theme… Every time the parent function gets called. Hello, I’m using Mantra theme and currently working for the child theme of it in order to keep my customization. I’ve been following this great tutorial for a while, but got stuck at “parent function removal’ thing and tried different ways in my whole day still haven’t figure it out. Hopefully you would like to help me out. Well, that works somehow. thanks a lot! Great article. I’ve been wanting to start building off of child themes and this really helped me understand it all. The attitude of this tutorial is really weird. I don’t think that serial killer joke is very funny, what if I actually did have a long term history of alcohol and drug abuse? It’s not really something to laugh about. I have a lot of friends with serious alcohol and drug problems and a history of abusive families, it doesn’t make them serial killers..it makes them people with difficult problems they are trying to get through. The whole mood of this tutorial is kind of aggressive. I know it’s trying to be funny, but to me the humour is randomly dark and kind of weird. It’s good to have a modern, edgy copy on your website, which breaks the monotony of reading stock standard copy and has a sense of humour…but when it comes to directly insulting the reader, you’re going to lose interest from them. I stopped reading halfway through and just decided to change to a different theme. Would it be possible to have this page as a printer friendly page, without the side column which is not needed on a printout. Is nirvana-theme able to handle a child-version? I use nirvana-theme and by doing like described in this tutorial, wordpress reports that the child-theme cannot be activated because the parent theme is missing. But both folders exist: “Make” & “Make-child” and the style.css in the child-folder is like explained above. What can i do? What about modifying a class like the one we can find in tempera/includes/widgets.php? It seems to need a different procedure. Any tips? That’s a rather difficult task. You can’t actually edit that class, but you can clone it and then unhook the original class’ functionality and hook your own into place. If I make my changes in the Nirvana Settings and the Nirvan Custom CSS window…will I LOSE those changes if I update the Nirvana theme in the future??? If I want to use a font OTHER than Google fonts or the supplied Nirvana fonts, will I need a CHILD THEME? Am I able to install other plugins, for example, a Portfolio plugin that I like?? Will I need to have a Child Theme for that? I’ve used Child Themes many times with another theme company, where the Child Theme was INCLUDED with the core theme. I made CSS edits, etc. to the Child Theme, and occassonally, some php code (for Excerpts, for example). I’ve never used a theme where I had to CREATE a Child Theme, so I am a bit unclear on what happens to the core Nirvana theme changes that I would make under Nirvana Settings. thanks very much, great theme, and excellent Forum support!! Thank you for the info. If all your edits are made in the theme options panels, and the only edits above that are custom css in the custom css section of the theme options panel, is a child theme necessary? If theme settings and custom CSS are enough to make your changes then you don’t need a child theme. Only if you need heavier changes like editing actual code, creating new functions etc, then you’d need a child theme. This is excellent. I have been in need of a child theme, but was always a little apprehensive to start one. Just started the tutorial, and got to the point where you recommend FileZilla. Not a bit fan of that program. It stores FTP credentials (site, user name, password) in a plain text file in the user’s folder. Easily accessible by anyone (or any hacker). Big security hole. I’d recommend WinSCP. Fully encrypted access, including a master password that you can set up. FileZilla works as an FTP client, but the plain-text user credential file is a big no-no for this computer security dweeb. If you want details on the security hole in FileZilla, I wrote about it two years ago here http://securitydawg.com/insecure-filezilla-ftp-program/ . I’ve stopped using it since then. They may have fixed it, but the developers didn’t think it was a problem two years ago, and weren’t going to fix it then. Is every Theme able to handle a child-version? Might be a silly question, but I bought the “make”-Theme from TheThemeFoundry and by doing like described in this tutorial, wordpress reports that the child-theme cannot be activated because the parent theme is missing. But both folders exist: “Make” & “Make-child” and the style.css in the child-folder is like explained above ….. hm?? We don’t usually answer questions that are not related to our own creations, but themes need to be written to support child theme advanced functionality override. Otherwise, all you’re able to change via child themes is CSS and the standard page/section templates. Also, the parent theme name is case sensitive, so “make” and “Make” are two different parent themes. I appreciated your comment very much. THX 4 your remark. I will ask TheThemeFoundry people. This might sound like a stupid question, but what is the purpose of a child theme? Is it placed on a subdomain or what exactly? Is Mantra compatible with the Hueman parent theme? Is Mantra a child theme? First time using the Tempera theme by the way and I love the adaptability – will definitely be using it again!